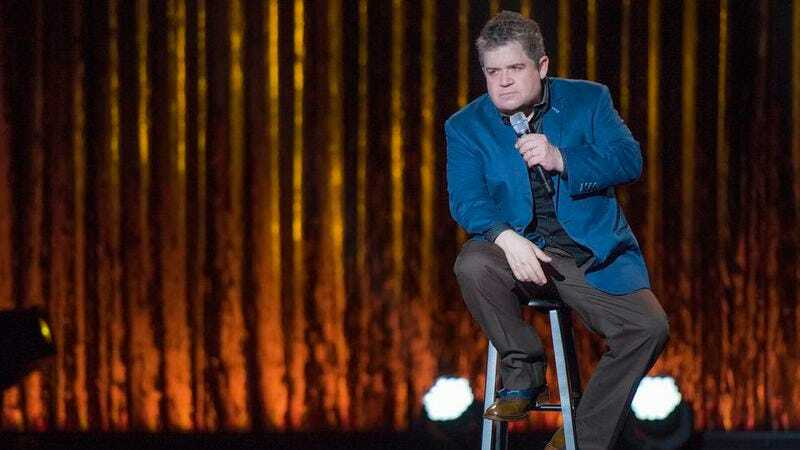 Patton Oswalt’s Netflix special, Talking For Clapping, is getting the vinyl treatment, and will be available this Friday, September 23. A “Blue Splatter” edition, autographed by Oswalt and benefitting educational non-profit 826LA, is already sold out. But fans of Oswalt and/or the rich sounds that only vinyl can provide, take heart. A special white -vinyl version is still available for $15 exclusively from A Special Thing Records. A regular black-vinyl version will be also available from Amazon and other retailers, for fashion-forward comedy nerds hesitant about listening to white vinyl after Labor Day. And Newbury Comics will carry the record with an autographed poster. Regardless of the pressing color, both versions will include two bonus tracks and a digital download. The superb, Emmy-winning comedy special was just one of several recent projects. Sadly, Oswalt’s artistically prolific year—which included terrific stints on Archer and Lady Dynamite—was overshadowed by the tragic, unexpected death of his wife, Michelle McNamara. But fortunately for Oswalt (and his fans), a recent Twitter beef suggests that while the comedian probably has a lot of grieving left to do, he’s at least feeling well enough to distract himself by taking a swing at one of America’s most fetid social piñatas.